Water is very essential in life, especially when you are on the road because packing cases of water bottles are too expensive. This means that you are going to need a water pump in your RV to get an ample supply of water while on your trip. Fortunately, the majority of RVs already have a built-in water pump. If you are thinking of replacing the water pump in your RV, there are good ones you can buy from online and the most common one is the 12V RV type of water pump. You will find here the considerations you need to make before buying a water pump and the different brands you can choose from. It is not advisable to just go ahead and buy any water pump because you also need to hear reviews about each one and there will be 5 products in this post. Even if these pumps are operating at the same voltage, they differ in terms of power and the pressure it gives. The most recommended way for you to understand water pumps on a better level is to look at its specs and look at the number of gallons it can pump every minute. You should also check the statistics of the PSI for a better idea, but it is simpler to understand the physics of gallons that gets pumped every minute. Normally, you are going to look for something that pumps about three gallons each minute for good power. The majority of the pumps have 12 volts with only a few that operate on 24 volts for trucks and buses. The detail is always according to the specification and it is recommended to put a fuse﻿﻿ in the wiring before the ﻿﻿electrical device. The recent draw found in these pumps is normally a bit low and from 2.5mm to 4mm wire in most cases that are enough. It is recommended that you run a twin wire up to the pump instead of placing earth on the chassis, like using chassis mostly lead to problems. How much noise a water pump produces is reliant on the type and how powerful it is. In order to lessen the noise of a tank pump that is free-standing, you can buy or make a pump cover to seal it off. A cover becomes the pump protector from elements, muffle and the noise. Although, make sure the cover is enough to let airflow in so the pump will not overheat. There are installed submersible tanks in the water tank and stay under the water. This one is able to minimize the pump noises, and save space. The basic pumps are only pumps and they need to be turned off and on using a separate switch. There are Inline and submersible ones that fall under this category. These can be placed directly through the spout or shower without putting a tap on. They can be stopped by turning off the pump using a switch. Even if it is tempting to pick the largest and powerful pump you can find, it is significant to remember that pumps need to draw energy when the tap is on. The more power the pump has, the more energy it has. This means that purchasing a pump that is too big for what you need can add to your electricity and water bills. To lessen the usage of energy, you need to lessen how many times your pump has to be activated. This can be made possible by having a gravity feed system, a pressure tank or a header tank system. 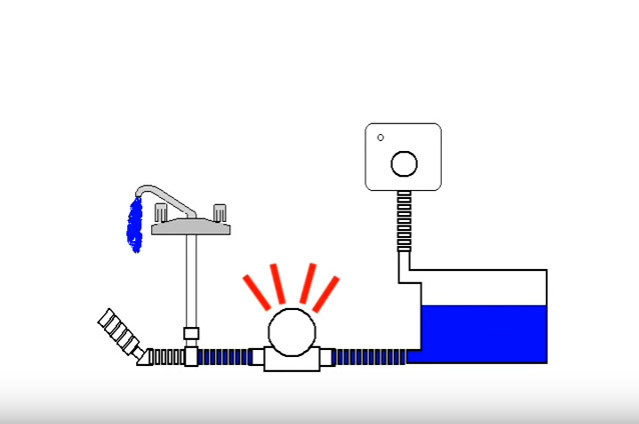 The cycling happens when the pump is turned off and on a few times while taking a bath. This is caused by the flow rate of the pump exceeding your water usage rate. If the pump has a rating of 10 liters every minute, this is going to cause cycling. 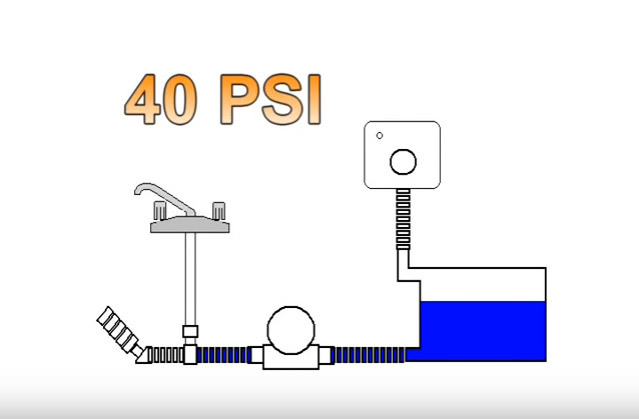 The pump should stop when there is a reduction of pressure in the pipe. When it goes below a preset value, the pump gets activated again. This will cause the pump to turn on and off, and sometimes right away. This is a self-priming water pump that has several by-pass with a low cycle. It operates quietly and has thermal protection. The pump is able to run dry without having any damage and has a built-in valve for checking. The dry can prime up to 6 vertical feet and it comes with a warranty of 2 years. The product dimensions are 4.8 x 5.5 x 11.5” and the weight is 5 pounds. 3 GPM, 55 PSI that pumps fresh water that moves around the unique diaphragm and internal by-pass. If you are someone who is not familiar with installing water pumps in your RV, you should buy this one because the instructions are very clear and you will not have a hard time. Aside from that, there will be no vibration that might scare you off. You just have to take extra care of it because it might get rusty right away. There is also a warranty of 2 years. It can connect straight to the waste outlet of the RV and it has a 3” hose. The pump can dump longer distances and you can flush out what’s inside your holding tanks at home by the use of a receiver. There is a discharge port for the garden hose and can rinse fresh water. Has a remote on and off switch that has been handheld with a 6” harness with a protection against run dry for up to 30 seconds. You can easily clean up and store the water pump, that has a portable case. The motor is a 12 Vdc permanent kind of magnet type that has been fully enclosed with a shaft. This is a very good product and I would buy it again if the one I have broken down. I just hope they do something about the instructions because they are pretty hard to follow, but everything else is great. This is a good option for you. The automatic demand design is able to eliminate the necessity of putting a tank and even difficult electronics. It comes with a thermal overload protection and it can run dry without having any damage. The built-in valve prevents a backflow and 6 vertical feet of a dry prime. It also replaces the Shurflo Smart Sensor Pumps. It is 12 volts and a maximum of 10 amps. The dimensions of the product are 6.2 x 6.2 x 12.5” and the weight is 5 pounds. The water pump is perfect except for the rapid cycle, but I still love it. Especially that it is easy to install and I was able to install it right away. I recommend this to anyone who is looking for any replacement. It has a new pump design that was made using a unique one-piece diaphragm and a by-pass that assures long life and good performance in all systems. It is designed to be the next reputable pump to go over the expectations of the customers. The pump is made for high flow, minimal noise, and no rapid cycle. The quality reputation is made for the reliability of all pumps and much lesser noise. The dimensions of the product are 4.90 x 8.10 x 4.30” and the flow rate is 2.3 GPM, 12 VDC. This is one of the pumps that have the best value and I am not left disappointed after ordering it. The customer service is great and it arrives quickly. The product has a design with four chambers for a good flow to fulfill all demands. There is no rapid cycling and designed for harsh environment and they are self-priming up to 6 and will run dry without causing damage. It is featuring a sealed motor and pressure, and e-coated housing so it will last long. With thermal breaker 2.0 GPM pumps that can handle 1 – 2 fixtures and the bigger pumps are for multi-installations. The weight of the item is 4.6 pounds. It is a pump I would also highly recommend because everything works as described. I also did not have a hard time coordinating with their customer service so the product came right away and everything was complete. Refer to this guide when you are going to buy an RV water pump because you will not go wrong.